It's been quite awhile since my first home learning post, and I'm really sorry about that. Haven't really planned any home learning activities that I felt were worthy of posting hence the lack of updates. In any case, here's a home learning activity that we did about a month or two ago, but recently revisited it again. This time we played with pom pom balls! What can you do with them? Well, lots! In fact, I've in mind some activities that I would like to incorporate when K is older and able to comprehend and focus better. For now, it's been more of exploring pom pom balls and what we can do with them. I first let Kaitlin play with the pom pom balls on her own while at the side supervising, just in case she puts them into her mouth. I guided her to think about the texture of it, and told her it was 'soft'. I also told how it was round like a ball. From her first encounter with the pom pom balls, she mainly listened to what I was describing. However, recently when she's been playing with them she refers to them as 'ball'. Shows she's listening and aware of her shapes. When we first played with the pom pom balls, I also introduced the tongs to her. Told her it's made of metal and is shiny and smooth. I demonstrated how I could use the tongs to pick up the the balls and put them back into the jars. She took a keen interest straight away and attempted it herself. First few tries she was of course struggling, but Daddy Li guided her and she got the hang of it eventually. Now, when she sees the tongs, she'll immediately use them to pick up the balls. 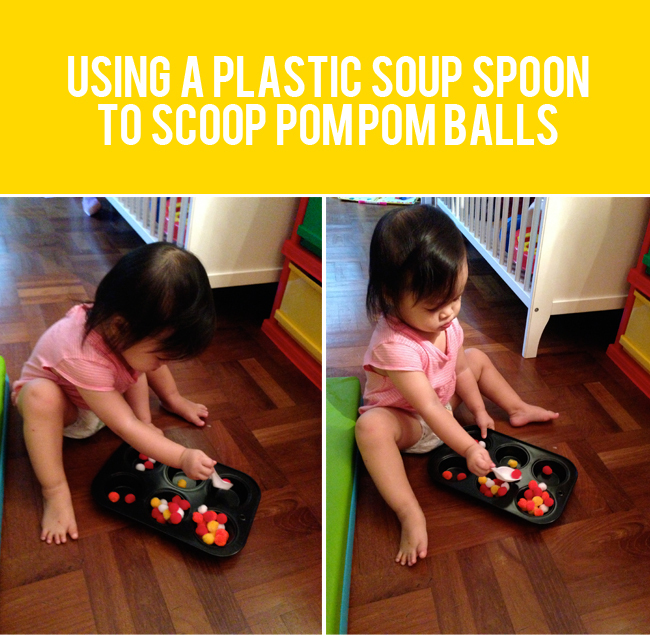 I think this is a great way for her to practice her fine motor skills, and perhaps it might even help her learn to use chopsticks in the future. She also learnt how to open and close the lid of the jar - another fine motor skill! In our most recent playtime with the pom pom balls, I introduced the muffin tray. 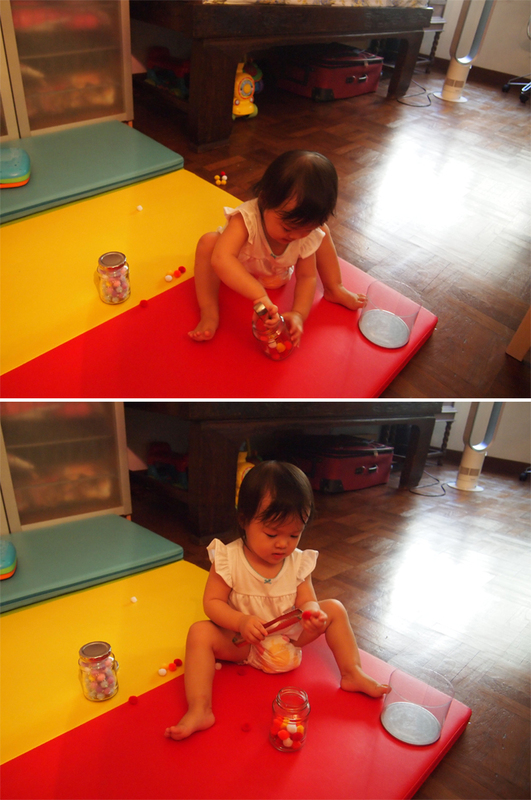 I took the opportunity to teacher her the different colours and how to sort according to colours. She didn't seem to really understand the sorting part, but still showed good effort. Perhaps when she's a little more older I can re-introduce the concept again. K could identify which were the red balls when I asked. When I asked what colours were the different balls, she said "red" to all of them. A little confusion to her I suppose, but it's fine cos I've read the developmental milestone chart that she should be able to name one colour when she's around 29/30 months old and she's only 21 months old now. 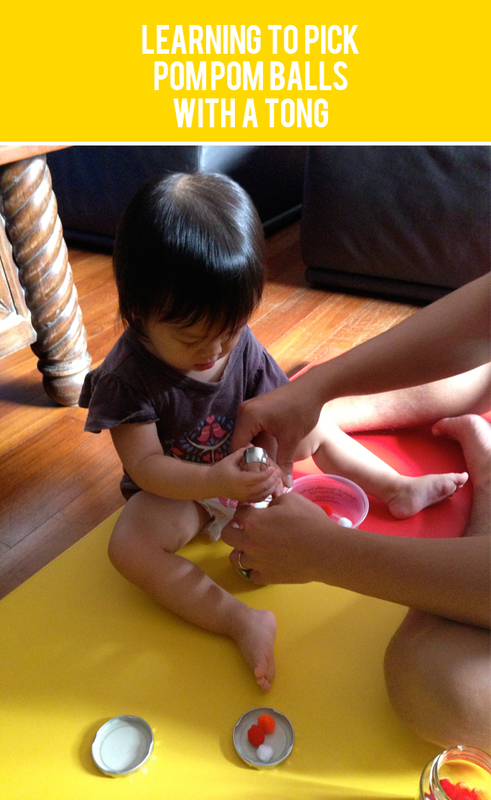 I introduced a variety of spoons (plastic soup spoon, metal tablespoon and teaspoon) and a ladle to her. I also asked her to listen out to the sounds made when she hit the muffin tray with the spoon and when she hit the glass jar. 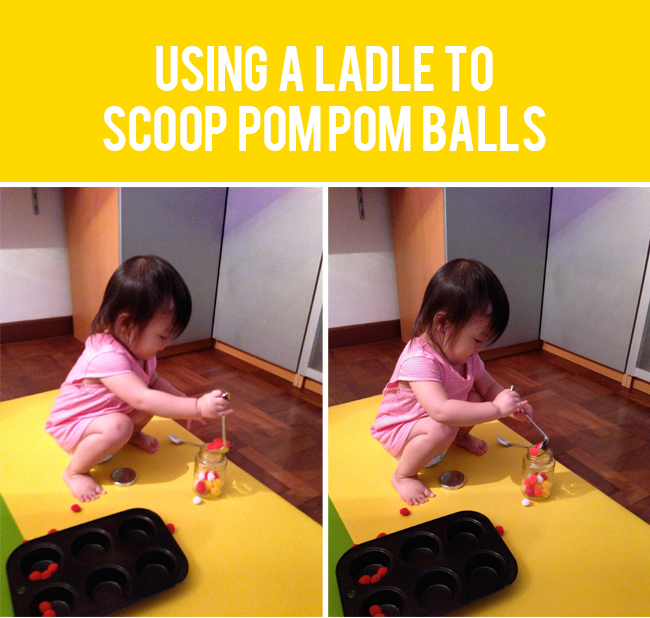 From this, she independently learnt how to scoop with different spoons, the concept of filling up and emptying jars as well as transferring the pom pom balls with her fingers, tongs, spoons and by pouring.